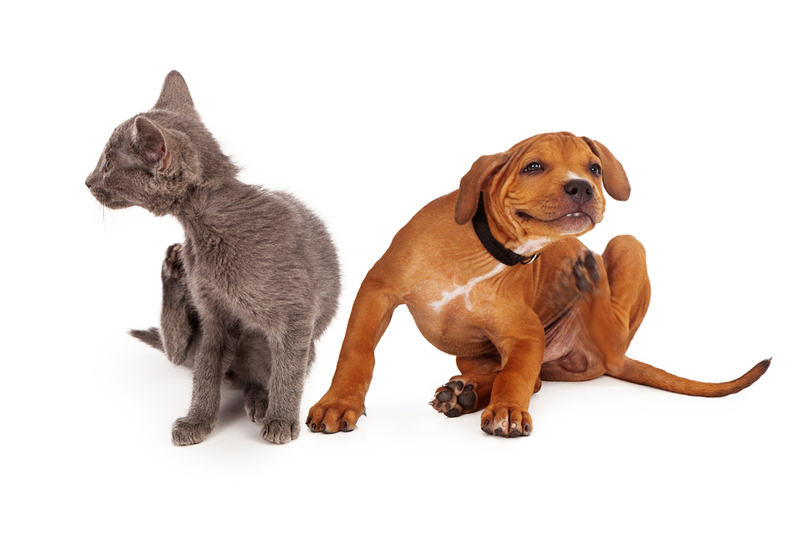 Anyone who has seen a dog or cat react to the itchy, discomfort that goes along with having fleas or ticks knows that neither of these parasites are desirable and most pet owners will likely want to be rid of them as soon as possible. But fleas and ticks are more than annoying, and they can affect you and the rest of your family -- not just your dog or cat. Some conditions associated with fleas and ticks include flea allergy dermatitis, lyme disease, and tapeworm. Although fleas and ticks are external parasites, ticks are second only to mosquitos in spreading both infectious and toxic disease that affect humans as well as pets. In order to fight off the presence of fleas and ticks, pet owners make a decision on what type of flea and tick treatment and prevention products to use on their pets. There are many available over the counter, including sprays, shampoos, or collars. Many over-the-counter products are not as effective as treatments that are available from your Bloomington veterinarian. The treatment provided by the vet can be either topical or it can be taken oral. Having a prescription flea and tick treatment is a step above just buying something at the local pet store or drug store, but in order for it to work right, it depends on a thorough application, which is not always easy with an energetic pet. It also means keeping a schedule, and generally the bigger the chore, the harder it is to stay on top of treatment. At Fairway Knolls Veterinary Hospital, we offer an alternative to traditional topical treatments with the Bravecto Oral Chew. The chew itself is flavorful, which means your pet will be excited to have the treatment, rather than fighting you. Each Bravecto chew contains the ectoparasiticide fluralaner, which provides protection against fleas and many common species of ticks for up to 12 weeks. Any fleas that arrive on your pet will also be killed within 24 hours during the 12 week period that the medication remains active, and any fleas that are already present should die with 12 hours of a dose. Since it is so easy to administer, it is far easier for owners to keep up with the schedule. For most pets, side effects and effectiveness of Bravetco chews are not a major issue, still it is important for pet owners to be aware of potential drawbacks in order to make the right decision for their pet on whether or not Bravecto is the right flea and tick treatment for their pet. Lone star ticks are somewhat more resilient than other types of ticks, so people who live in or visit areas where these types of ticks exist may need more frequent dosing, since Bravecto is only effective for 8 weeks with this species. Young puppies may also need additional treatments in order to stay flea and tick free, since studies have also not proven the treatment to work as well in puppies that are less than 6 months old. If you have a young puppy, we at Fairway Knolls Veterinary Hospital can help you determine whether Bravetco chews are your best option, or if another type of treatment might work better. Nearly every medical treatment for humans or animals carries the potential for side effects. For Bravecto chews the most common side effects include a decrease in appetite, vomiting, lethargy, flatulence, diarrhea and excessive thirst. If you notice any of these, you should see your veterinarian for advice and treatment. To learn more about Bravetco, or other flea and tick treatments contact Fairway Knolls Veterinary Hospital at %CLIENT_PHONE% top schedule an appointment.